Behind every cloud is a silver lining. In 2012, four California cities declared a fiscal emergency and/or filed for bankruptcy. 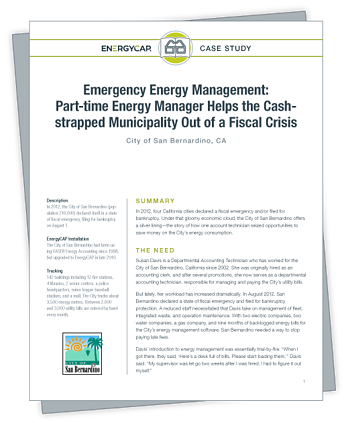 Under that gloomy economic cloud, the City of San Bernardino offers a silver lining—the story of how a part-time energy manager seized opportunities to save money on the City’s energy consumption.